NBC5’s outgoing Cory Smith and incoming Laura Harris. Due to “family reasons,” NBC5 anchor/reporter Cory Smith will be leaving the Fort Worth-based station when his contract expires at the end of this year. 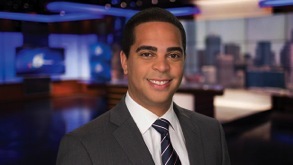 His eventual replacement, Laura Harris from ABC affiliate WFTS-TV in Tampa Bay, FL, was announced Friday to station staffers by vice president of news Mark Ginther. Smith, who has been anchoring NBC5’s 5 and 10 p.m. weekend newscasts and also reporting three days a week, arrived in December 2015 from KSAT-TV, San Antonio’s ABC station. He’s a native of south Oak Cliff, and will now be looking for opportunities outside of Texas, according to Ginther. Harris, who’s been reporting for WFTS since July 2012, earlier had been a morning anchor with Charleston, SC’s WCIV-TV, also an ABC affiliate. The Georgia Southern University graduate was a Division One soccer player while in college and is a “big sports fan,” Ginther said in his staff memo. She also has worked for CNN, TNT Sports and WNEG-TV in Athens, GA.